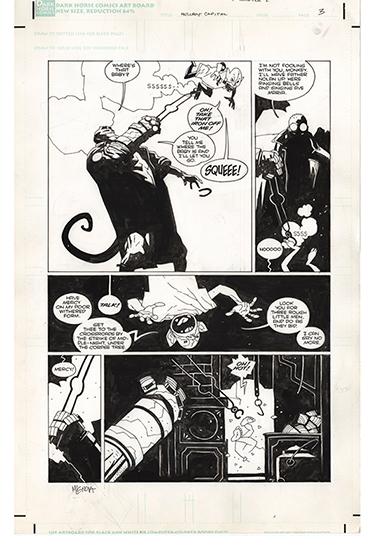 IDW’s Mike Mignola’s Hellboy in Hell and Other Stories Artist’s Edition scares up the master storyteller’s wonderfully gothic design for collectors through its transformation from sublimely shadowed action scenes to the more wonderfully atmospheric animated style he has adopted over time. Additionally, all but three of the 200 pages of this beautiful edition – which is now in its second printing and sports a striking new cover – have been shot in full colour from the original black-and-white art. 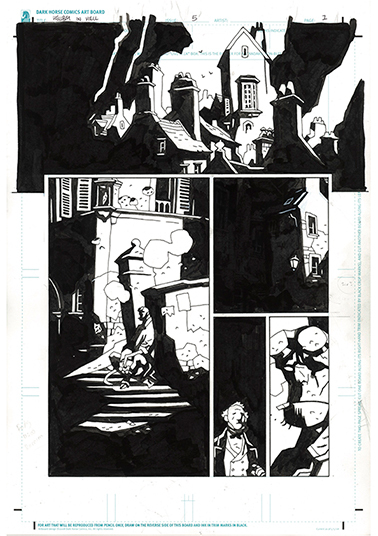 This handsomely showcases Mignola’s dark delineations as close as possible to the physical page. 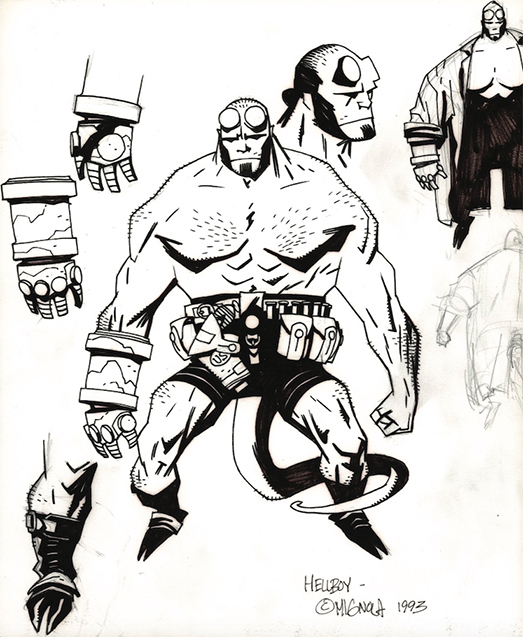 Conjured in the early 1990s, Mignola’s Hellboy quickly became a favourite with fans and critics alike. 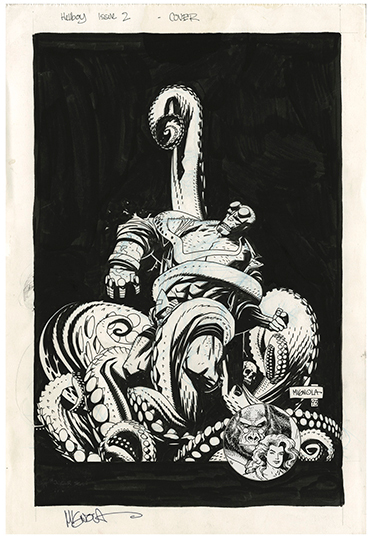 In fact, his creation garnered the stellar artist accolades as well as awards aplenty. 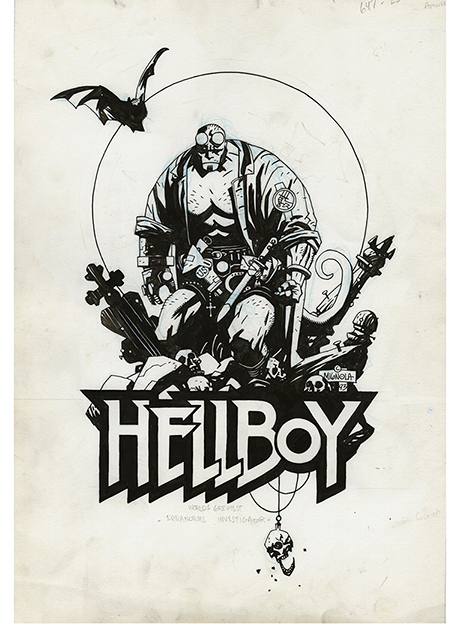 Hellboy comics and graphic novels have topped readers’ lists for more than a quarter century. 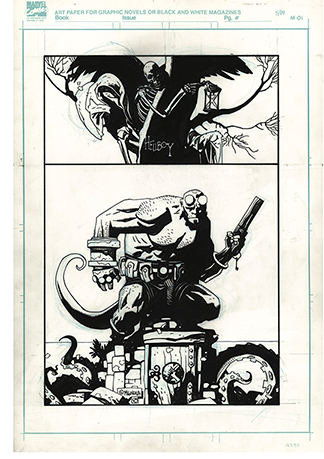 In addition, Mignola’s hellish hero has also leaped off the four-color page to the silver screen with two phenomenally popular movies, an acclaimed animated film, and a much-anticipated reboot of the film franchise scheduled to launch on cinema screens this April. This must-have artist’s edition celebrates all those accomplishments – while creating some of its very own. 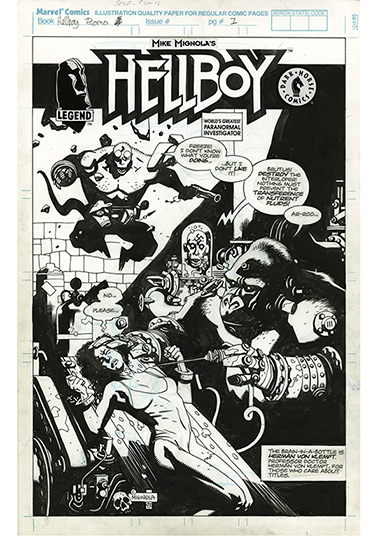 First, readers are introduced to a handful of Mignola’s modern masterworks – including the first five issues of Hellboy in Hell. The engaging story – printed sans script in this edition –showcases firsthand for readers the sheer power of the award-winning artist’s storytelling skills. 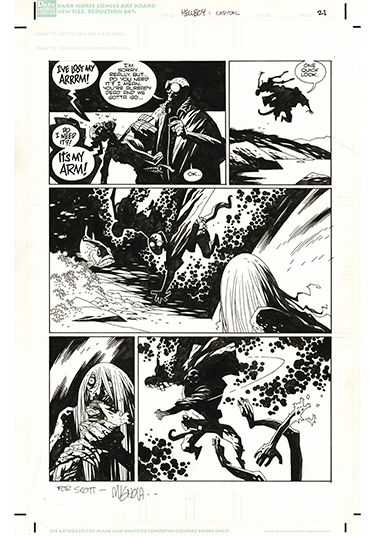 Through his stylised panels, the legendary creator’s haunting tale comes to vivid life – and practically jumps off the printed page. Then, there is the short story entitled “The Corpse,” which was captured on film as the lead up to the firstHellboy movie. Collectors should not forget two other tales selected by the artist for inclusion in this edition: “The Ghoul or Reflections on Death and the Poetry of Worms” and “The Troll-Witch.” Through the use of aptly placed inks and negative space, each action-packed yarn conjures the popular hero’s midnight majesty in all three mood-filled pieces. 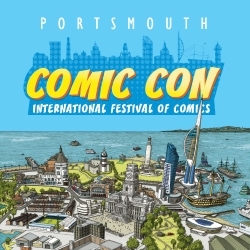 IDW also treats the Mignola enthusiast to the earliest examples of the “World’s Greatest Paranormal Investigator’s” adventures, including two four-pagers produced for promotional purposes in The Comics Buyer’s Guide and San Diego Comic-Con Comics. 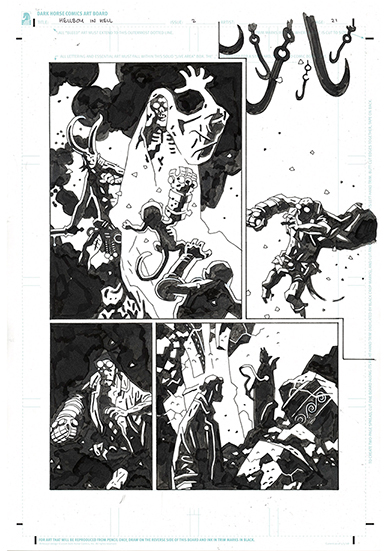 There is also the 10-page “Faith” story introducing the man-monster in the now-classic John Byrne’s Next Men #21. 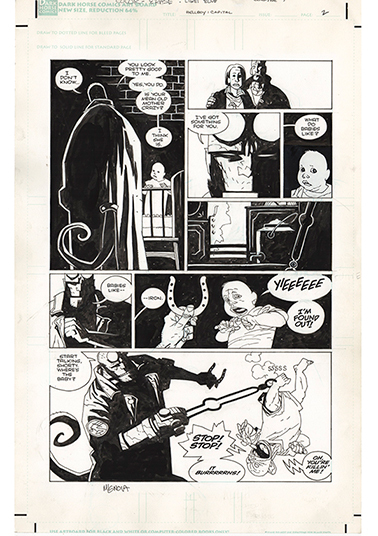 Then, there is reproduced artwork that true fans of the medium will not want to miss, including a darkly striking design page; two unpublished promotional pieces; an eye-catching house ad; an original design for the first sold-out Hellboy T-shirt; and two covers from the critically acclaimed Hellboy: Seed of Destruction mini-series. All of it shown in all its glory, and all of it stunning and well worth the price of admission (as readers who purchase this masterful tome will quickly find). Both casual readers and longtime fans will learn by reading page one to the creator biography that wraps up the book that the devil is in the details. And, this artist’s edition behooves collectors to discover that fact for themselves.